“A minimalist, I strive to create art that touches people on a primal level, exploring universal themes that circumvent the limitations of language and culture.” Ojai sculptor Douglas Lochner thus describes in true minimalist fashion the work he creates from metal, stone, wood, ceramics and, especially, glass. In his hands, the inert materials come alive as in the series Trinity, on exhibit recently at the Ojai Valley Museum, where red glass flows over and is suspended from a forged iron hanger in such a way that a breeze creates delicate motion. 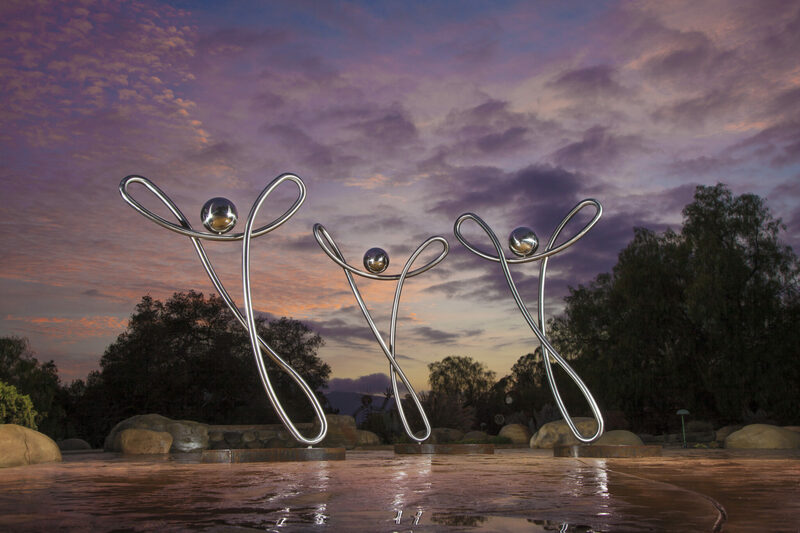 On a much larger scale, Doug has been selected to create a major sculpture, Wings of Honor, for the Santa Barbara Airport. Doug’s career path has taken him from photography to advertising to electronics and software. He now focuses his energy and talent on fine art and has found a wide audience for both public art installations and private commissions. In 2014 his expertise in software combined with creative genius made possible “Stream,” a real time, fully interactive intelligent sculpture that must be seen to be believed. In all of his various pursuits, passion for his work and a desire to push material limits create works that evidence mastery of industrial materials with an artistic sensibility. Lochner’s documentation was sponsored by Joyce and Ted Lombard. The AfterGlow was hosted by Patricia and Bruce Kuebler.